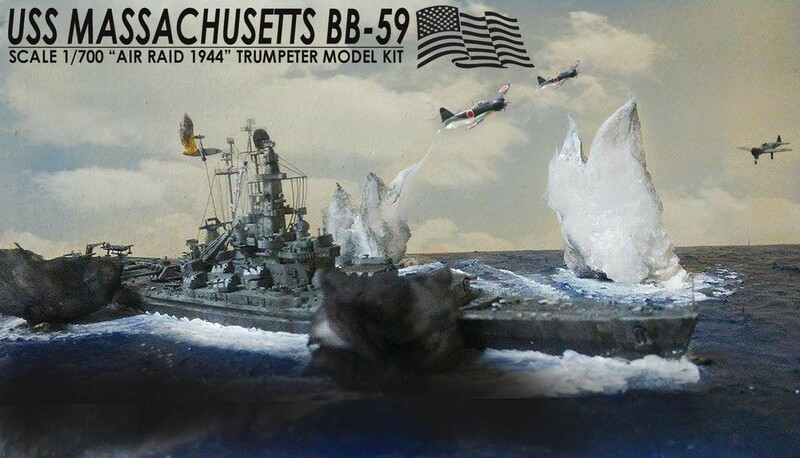 Construction : The model kit is from Trumpeter’s USS Massachusetts BB-57 model kit which was built out of the box with little issues in terms of fittings and overall engineering. Generic WWII US navy PE railings was attached to enhance the realism and overall detail. 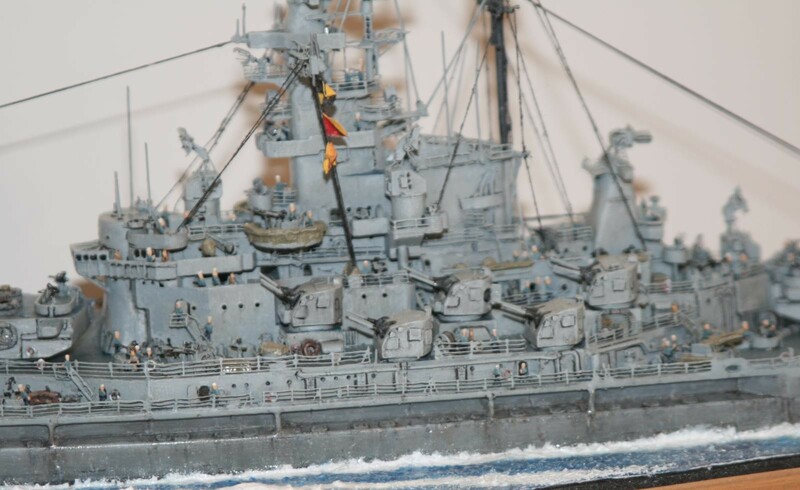 Painting Work : The overall scheme was based on the ships appearance circa 1944-45 with overall light grey for upper structure and sea grey for 3/4 of the upper hull area. 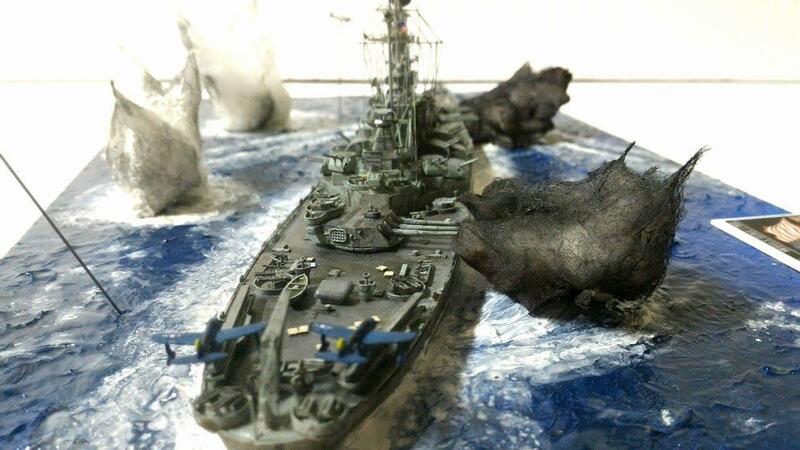 I wanted to model to look severely weathered hence making alot of streaking effects using AK weathering sets as well as explosion effects using cotton soaked with mount spray and airbrushed to introduce smoke darkness. 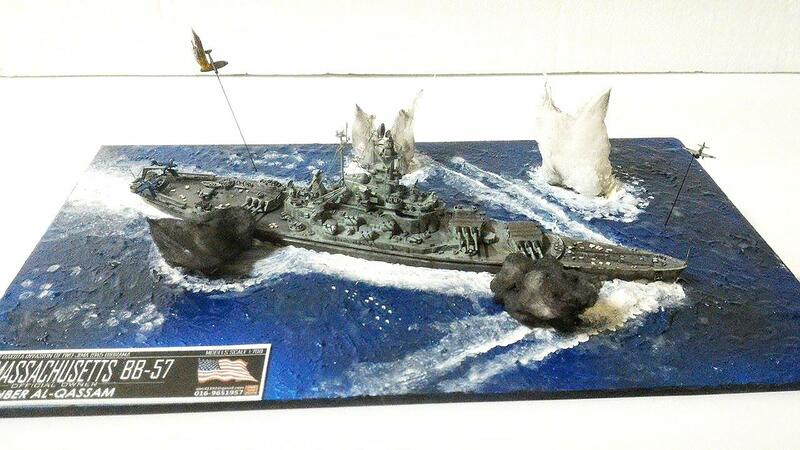 The diorama tries to depict her involvement during the Formosa strike circa 1944 with explosion of near bomb misses and a Japanese dive bomber being shot at. 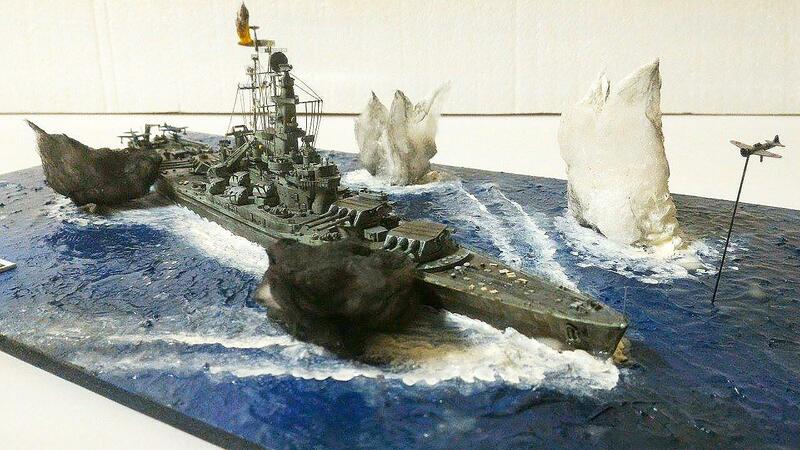 Conclusion: Overall it was a stunning experience making the whole diorama I believe new lessons were learnt in this process of making it. Very creative – looks great! 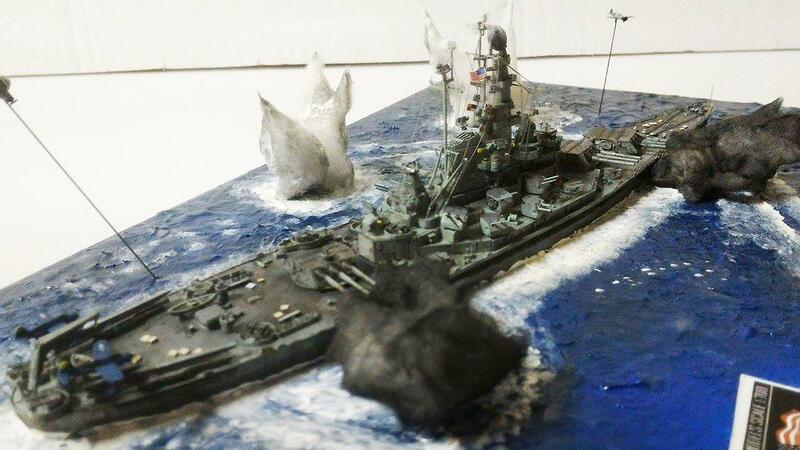 The splashes and gun smoke add energy to the diorama. I like it….nice presentation. Welcome. Hey Mee. You modeled my favorite ship. I love it and the whole scene is awesome! Great effects and weathering. I grew up and still live within a few miles of this ship. I have explored every inch of her since I was a young child. I have slept over on the ship during cub-scout outings with my son. You touched my heart! 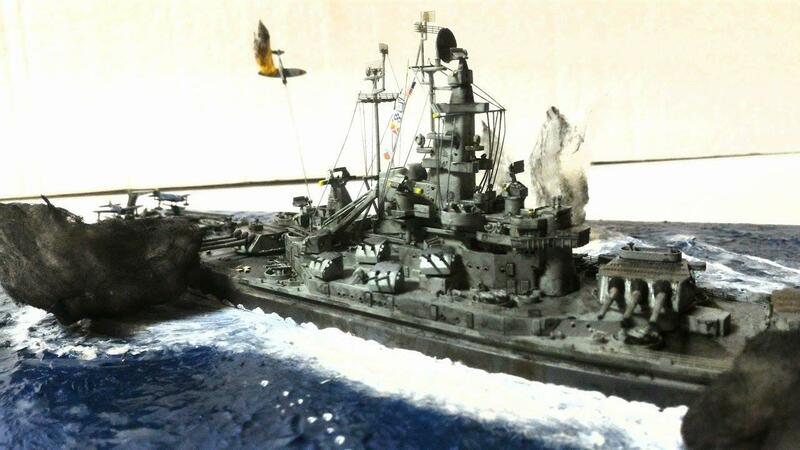 Here is a few pictures of my 1/350th rendition of her using the Trumpeter kit as a base but added tons of stuff. 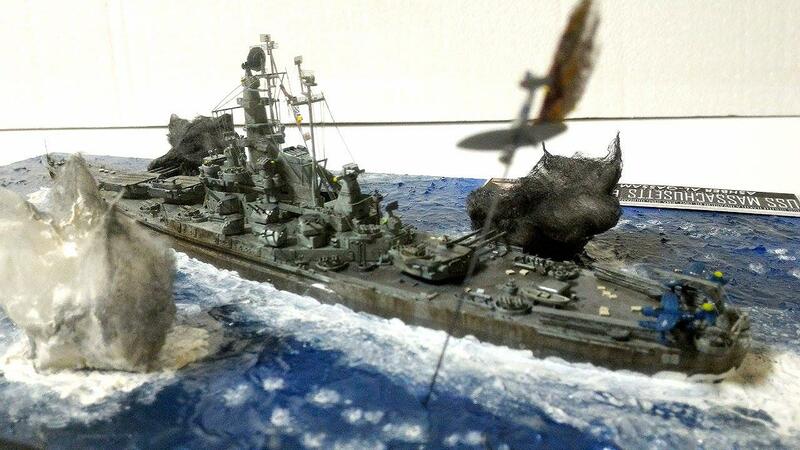 nice work paul… Im not really skilled yet to start on 1/350 scale…probably soon ! Mee I think you will have no problem with 1/350th. I think it is easier to work with 1/350th b/c parts are larger and easier to work with, especially the PE parts. 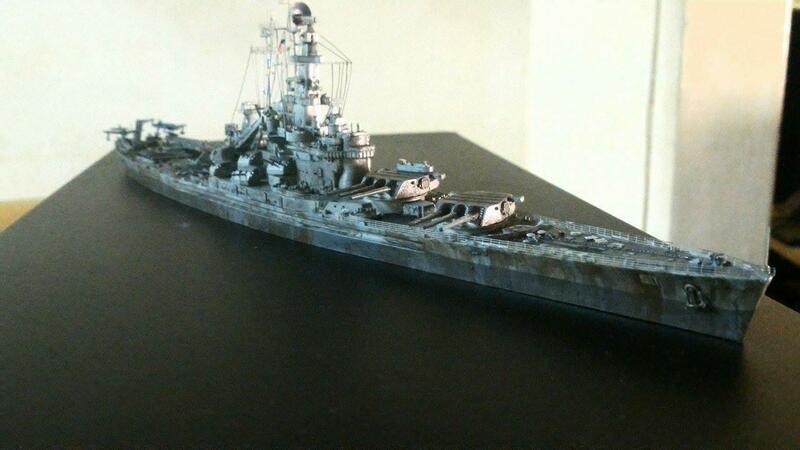 I dont think I could of done this in 1/700…to small for me. Please don’t take what follows as criticism, since it isn’t. I hope from this you will see that research is 80% of a project like this. I’ve written a history of the Central Pacific campaign. During what the USN called “the Formosa strikes” and the IJN called “The Battle of the Formosa Sea” (where they claimed a score sunk larger than the Third Fleet total, convincing themselves they had a great victory, which led to the naval disaster in the Philippines at the end of October in the Battles of Leyte Gulf). 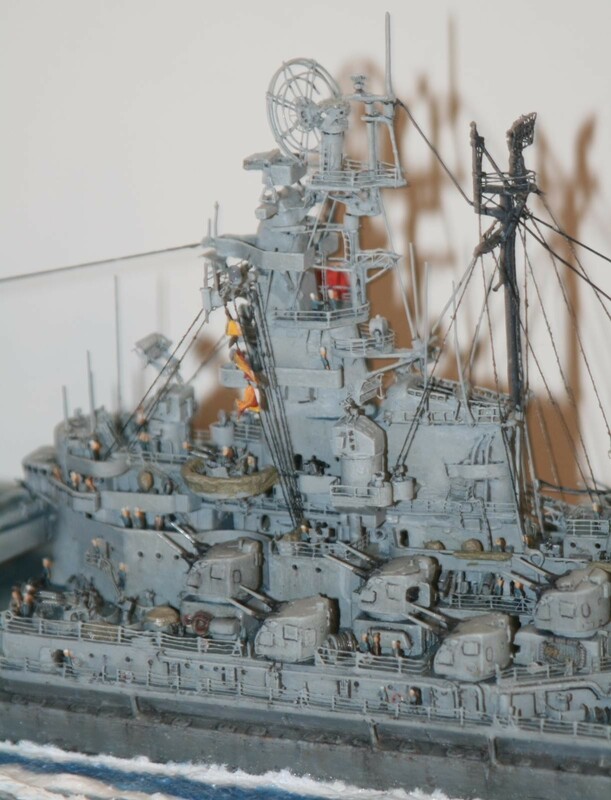 The US battleships accompanying Third Fleet never fired on anything. 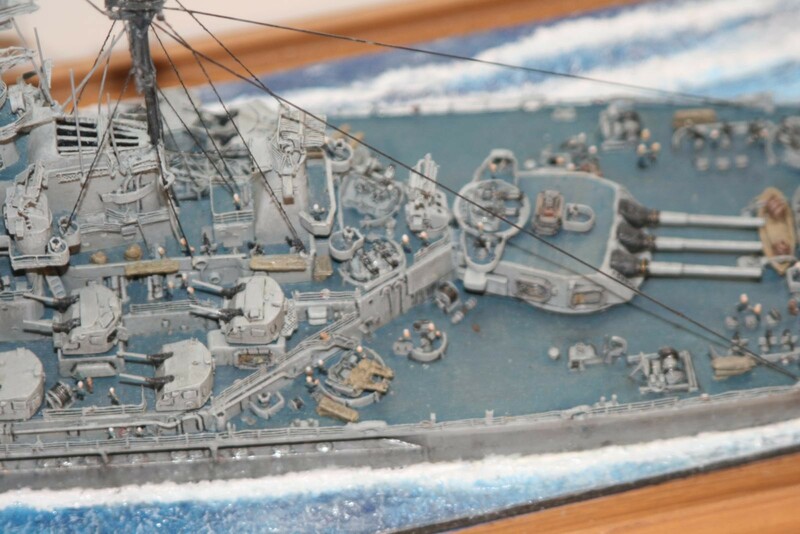 However, you have done an excellent re-creation of battleships opening fire, something very few have ever managed. The only time in the Pacific War (other than supporting invasions) that the battleships opened fire like this was during the attacks on mainland Japan in July 1945. This event would be a more accurate recreation. As I said, this is not a criticism. You do excellent work. As anyone who wants to be a Serious Modeler (as you already are) comes to realize, Research isn’t everything, it’s the only thing. If your work wasn’t as good as it is, I wouldn’t say anything like this. Supermarine Spitfire F Mk.24 – 1/48 Eduard, Aires, Falcon,..